Each chapter is full of practical and proven tools for improving any marriage. Just Married includes quotes and stories from Church leaders as well as some of the latest research in the field of marriage. 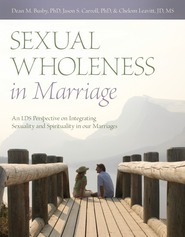 Also included are suggested supplemental readings and discussion prompts for couples. Amid the abundance of tips, research, and insights shared in this inspiring book, the most valuable piece of advice can be summarized in one simple statement: the key to a happy marriage lies in learning to treat your spouse as the Savior would.